← In the News: Captain America, Serpents, Google’s Gods, and more! Poor Alexander. But as Mary-Jane Rubenstein’s superb Worlds Without End: The Many Lives of the Multiverse documents, reckoning with the existence of other worlds has a way of driving folks to their wits’ end, whether they be Macedonian God-Kings, Scholastic theologians, Classical philosophers, Early Modern astronomers, or contemporary theoretical physicists. Rubenstein’s lively yet erudite volume surveys more than two millennia of Western attempts to both entertain and repress the contemplation of the possibility of other worlds and other universes (the connotations of both terms gets tricky fast) while also tracking the subtle peregrinations of those efforts across traditional disciplinary boundaries, probing their implications for reconfiguring the relationships between philosophy, physics, and theology. In other words, Rubenstein’s book functions first to document a kind of hidden genealogy – where the doctrines of Atomists like Anaxarchus haunt the hypotheses of contemporary quantum physicists, Stoics rub shoulders with string theorists, and Nicholas of Cusa collides with contemporary inflationary cosmology. Worlds Without End also explores the conceptual problems posed by thinking singularity and multiplicity in tandem in order to open up new possibilities for inquiry. The result is a dazzling tour de force, equal parts history of philosophy, science, and religion, as well as a formidable, original philosophical inquiry in its own right. At the risk of oversimplifying, Worlds Without End is preoccupied with the most fundamental questions of epistemology, ontology, and metaphysics as they intersect in interrogating the origins, character, and fate of the most abstract object of all: the universe itself. Rubenstein’s thinkers all grapple with the same questions: Why is there stuff? How much stuff is there? Where is all the stuff, and why is it distributed where and how it is? Is there more stuff out there that we can’t observe? And if so, does that stuff resemble the stuff we can see, or is it different, and where is it in relation both to our physical location and to the conditions that predetermine what we can observe? Has there always been stuff, how do different kinds of stuff interact, and what will happen to all of it, if anything, in the end – if there is an end at all? And, lurking behind all those questions murmurs another, existentially plangent one: where do we, qua human beings, figure into all this – into a universe of stuff that seems so “finely tuned” to our existence? Time and again, Worlds Without End reveals that it is most often attitudes towards this question – a matter not simply of faith or ideological commitments, but also of aesthetics and even temperament – that determines how various thinkers come down on the idea of multiple worlds, often despite contradictory evidence or even the logical outcomes of their own arguments. The ancient world also offers plentiful examples of traditions that champion multiplicity outright. Atomists like Democritus and Epicurus proposed a plurality of universes generated by random collisions, representing a “spatial multiplicity.” Lucretius, who drew extensively upon Epicurus’s notion of an atomic “swerve,” offered a “temporal multiplicity,” wherein an infinitude of universes fade in and out being. Meanwhile, the Stoics opted for a model that is eternal, but features a single cosmos that eternally returns after being destroyed in fire (epyrosis) and re-arising from the ashes of its predecessor. Rubenstein’s reading of these philosophers, which draws upon both Michel Serres and Nietzsche, is lucid and elegant. For their part, Christian theologians had to articulate cosmogonies without violating their commitments to an omnipotent, singular God and the doctrine of creation ex nihilo – while also figuring out what to do with the Trinity, which rather problematically is at once one and yet multiple. While Origen argued for a multiplicity of Creations, for Augustine, the very idea produced a visceral repulsion. As Rubenstein demonstrates, Augustine’s “revolted despair” seems to stem from his horror at the notion of an eternal return, and has less to do with his theological conviction that the Christ event must be unique and more to do with his own desire that “the blest” not have to rediscover their faith over and over again – in other words, from a quite personal desire not to repeat the full trajectory of his Confessions ad infinitum. Later, for Scholastics like Aquinas, the rediscovery of Aristotle’s claims about the eternity of the world posed problems, as did squaring God’s omnipotence with His creating an infinitude that would rival His own. The theological gymnastics involved here are intricate (namely, stipulating why God could create multiple worlds, but wouldn’t, and that singularity belongs to the Godhead proper, multiplicity, to creation) but all this became moot when, in 1274, Bishop Étienne Tempier of Paris condemned the idea of multiple creations as heretical tout court. From then on, arguing for multiple worlds started to get dicey. While Cardinal Nicholas of Cusa (1401-1464) was able to propose a highly idiosyncratic cosmogony, what Rubenstein terms a “perspectival multiverse” and get away with it, with the advent of the Reformation and Copernicus’s assault on the heliocentric model, the stakes quite literally heated up. Indeed, Cusa’s flamboyant self-proclaimed heir, Giordano Bruno (1548-1600), who argued for a spatially infinite universe full of solar systems populated by intelligent life, was burned to death by the Inquisition . But by this point, the cat was more or less out of the bag – and Galileo’s heliocentrism meant that it could never go back in. Paradoxically, however, as Rubenstein observes, the development of the telescope had “the duplicitous effect of both extending and narrowing the cosmological vision of Western Europe.” Speculation turned away from multiple “universes” and toward the existence of other worlds (planets) – in other words, to stuff that is observable. Thus, for all the implications of his theory of elliptical motion, Kepler argued for a finite cosmos, extending only insofar as it is observable. Likewise, Descartes refused to speak of things as “infinite,” maintaining that, at best, we can call such stuff “indefinite,” even as his cosmogony seems to suggest the possibility of extrasolar planetary systems. Kant’s writings aside (and bracketing the zany cosmology of Edgar Allen Poe), until well into the modern era, scientists and philosophers adhered closely to the confines of the observable and imagined the universe in resolutely singular terms. Indeed, in his Theory of Relativity (1916), Einstein stressed that the universe must be singular, eternal, and static. But with Edwin Hubble’s 1924 observation of distant galaxies (what he termed “island universes”), everything changed. Suddenly, the universe appeared to be spatially infinite, populated by galaxies we now estimate to number in the billions. Moreover, the observation that those galaxies appeared to be moving away from each other re-opened the possibility that the universe was not eternal – that in fact it was reeling from the outcome of an originary, explosive Big Bang. The Big Bang put cosmogony back on the map, and “staged a return of the mythological at the heart of modern science.” It also provided an entrée for theological speculation and correspondingly frenzied efforts on the part of numerous scientists to find an explanation that did not imply a God operating at the beginning of things. For readers in the humanities, what follows can at times seem dizzying. But Rubenstein remains an incredibly clear guide not only through the ensuing century’s worth of discoveries and the theories that attempt to explain them, but also in illuminating the fundamental questions they seek to answer. Those questions are familiar ones. Indeed, with the discovery of Cosmic Microwave background radiation (residue from a shortly after the Big Bang) establishing firmly that our universe did “begin,” the “Why is there stuff?” question returns with a vengeance. Likewise, the development of inflationary cosmology and the observation of a countergravitational force (so-called “dark energy”) pushing the universe’s contents apart ever faster brings up what is known as the “fine-tuning” problem, which asks what we are to make of the radical contingency of the emergence of complex, intelligent life (i.e., us) against the backdrop of a “precarious perfection” of laws of physics and cosmological constants. Multiverse hypotheses offer one possible answer to this problem: life exists in this universe because there are an infinite number of other universes governed by other physical laws and constants, and we just happen to live in one that’s just right – a “Goldilocks universe,” if you will. Rubenstein catalogues a litany of multiverse theories, hypotheses that variously draw upon modern astronomy, cosmology, quantum physics, string theory, and more. The taxonomy is remarkable: we learn about the hypothesis of an “endless and overlapping ensemble of observable universes” all generated by the same Big Bang; a “fractal cosmology” in which multiple Big Bangs occur at different times; a string-theory-based model featuring an infinite number of universes; doppelganger universes; a revised “ekpyrotic” model wherein the universe consists of a “brane” and corresponding “antibrane” that regularly collide, producing Big Bangs seriatim; universes generated by black holes; simulated universes; a “multiversal bath” hypothesis wherein different universes bear the inflection of interactions with one another; and much, much more. 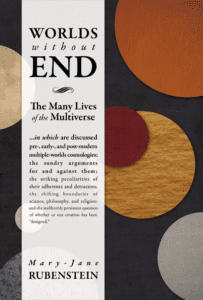 We also learn about the most well-known multiverse model, the Many Worlds Interpretation (MWI), where an infinite number of worlds is generated by every conceivable event – not just on the quantum level, but also on the levels of natural occurrences and, tantalizingly, human decisions (i.e., such that there exists a world in which my grade school math teacher didn’t regularly drive me to tears in class, and I went on to get an advanced degree in physics, consequently leaving me free of the acute fear that I am heinously distorting each and every one of these theories). Rubenstein grounds this heady catalogue by regularly invoking parallels between contemporary theories and their ancient and premodern predecessors. Although at times the reader finds herself wishing for a glossary of terms or even a dramatis personae, this perspective is vital. Indeed, by keeping religious, philosophical, and scientific precedents in mind, Rubenstein reveals that what at first appears to be a tug-of-war between explanations of the origin of the universe in terms that do not suggest “intelligent design” versus ones that do, both positions consistently resonate with ancient predecessors, and, moreover, that those accounts that seem most ‘anti-theological,’ also, paradoxically, open the door for quasi-theological speculation. Temperamental dispositions and existential anxieties, it emerges, appear to be just as much a determinant in shaping the research of today’s theoretical physicists as they were for Augustine or Lucretius. The culmination of Worlds Without End is particularly elegant, and resists easy summary. Suffice it to say that Rubenstein proposes a reconsideration of tidy distinctions between physics and metaphysics, religion and science, and more besides, all while raising trenchant questions about the value of cosmogony as a topic of meaningful religious consideration in the first place. At once magisterial and graceful, Worlds Without End is not a fast read, but its effect is nonetheless heady and intoxicating, even if administered in slow, steady doses. Readers interested in the easy conquest of worlds may find themselves dismayed, but those willing to feel at once humbled and inspired by the contemplation of possible new ones will find much to wonder at here.